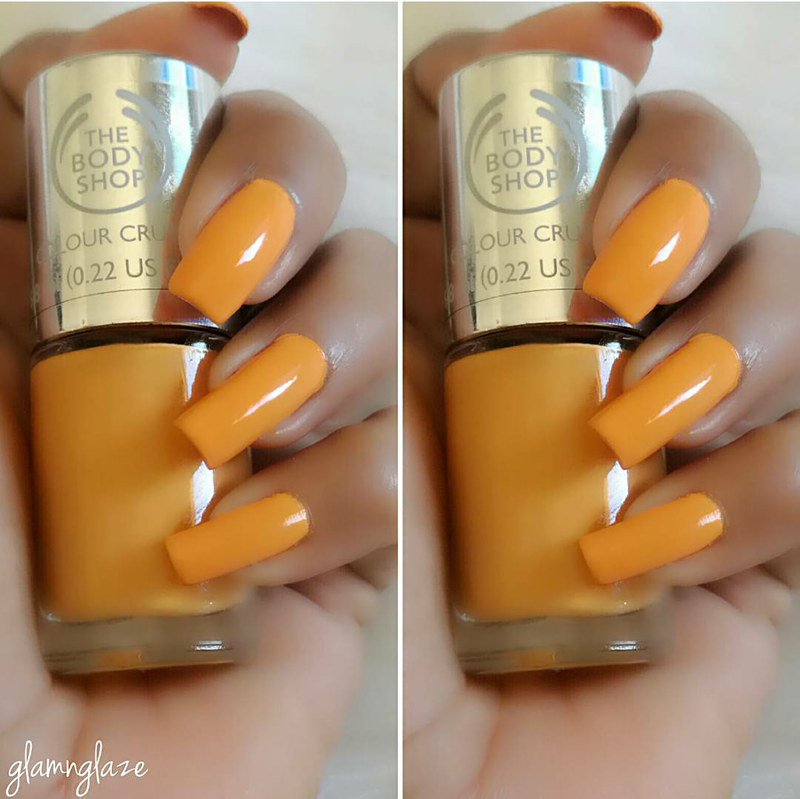 Today I am going to share my experience with The Body Shop's Colour Crush nail polish in the shade Apricot Kiss! The Body Shop International plc, trading as The Body Shop, is a British cosmetics and skin care company owned by L'Oréal. It was founded in 1976 by Dame Anita Roddick and currently has a range of 1,000 products which it sells in 3,000 franchised stores in 66 countries.The company is based in Littlehampton, West Sussex, United Kingdom. Our range of high-impact, high-gloss nail colours will keep you looking beautifully polished. Choose from over 29 stunning shades for quick drying, highly pigmented results. It's nail happiness at your fingertips! Apply two coats of your chosen Colour Crush™ nail colour. Once your nails have dried. There are twenty-nine shades available in the Colour Crush nail polish range,I picked one shade called 230,Apricot Kiss. Butyl Acetate (Solvent), Ethyl Acetate (Solvent), Nitrocellulose (Film Former), Phthalic Anhydride/Trimellitic Anhydride/Glycols Copolymer (Film Former), Acetyl Tributyl Citrate (Plasticiser), Acetyl Triethyl Citrate (Perfuming), Isopropyl Alcohol (Solvent), Stearalkonium Hectorite (Viscosity Modifier), Styrene/Acrylates Copolymer (Film Former), Mica (Opacifying Agent), Adipic Acid/Fumaric Acid/Tricyclodecane Dimethanol Copolymer (Viscosity Controlling Agent), Copernicia Cerifera Cera (Stabiliser/Viscosity Modifier), Sclerocarya Birrea Seed Oil (Skin Conditioning Agent - Emollient), Citric Acid (pH Adjuster), Tin Oxide (Opacifying Agent). [+/- CI 77499 (Colour), CI 77742 (Colorant), CI 73360 (Colorant), CI 77891 (Colorant), CI 19140 (Colorant), CI 15850 (Colorant), CI 77510 (Colorant), CI 42090 (Colorant), CI 77007 (Colorant), CI 15880 (Colorant), CI 60725 (Colorant), CI 77491 (Colorant)]. 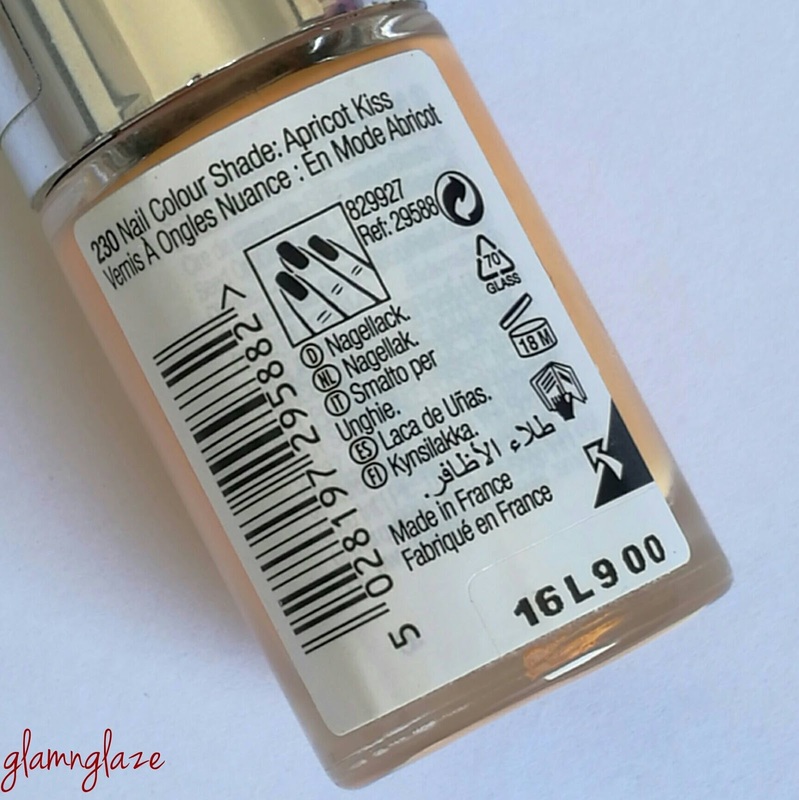 230,Apricot Kiss is a very nice summery shade and will suit all the skin tones.It's a apricot-orange-yellowish shade. The formula is not very runny or thin.I actually like the consistency of the product. The nail-polish lasted for about five days straight.After that it started chipping off from the tip of the nails slightly.Glossiness of the nail paint was still there intact(98%) even after five days.Of course the sheen had faded(2%) just a little bit after five days ,but, nothing to bother as such.I am happy with the formula of the nail-polish. 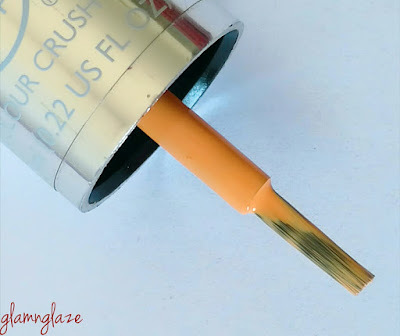 Overall,I really love the shade Apricot Kiss and I suggest that you check out the entire shade-range of Colour Crush nail polishes as they have everything ranging from the nudes to the bold greens,pretty pinks to ravishing reds! Vibrant shades...I must say.